Technically it is now Saturday, at least in this time zone, so I guess this doesn't count as posting a ridiculous number of posts in one day. Sadie has a doll that she hauls around everywhere. She named her Bibiana, after hearing the name in my book of Catholic Baby names and she and "Bibby" have become fast friends. But Bibby didn't have a princess dress. And while Sadie hadn't said anything, she kept changing her clothes back and forth between the ones she had and I could tell that she wished Bibby had something a bit dressier. And something that was a bit more purple since she's all about purple these days. So after I finished my work for the night I looked around and found some scraps of fabric and started sewing. It's not the fanciest princess dress I've ever made but I have a feeling she's going to be thrilled! She's going to love it!! 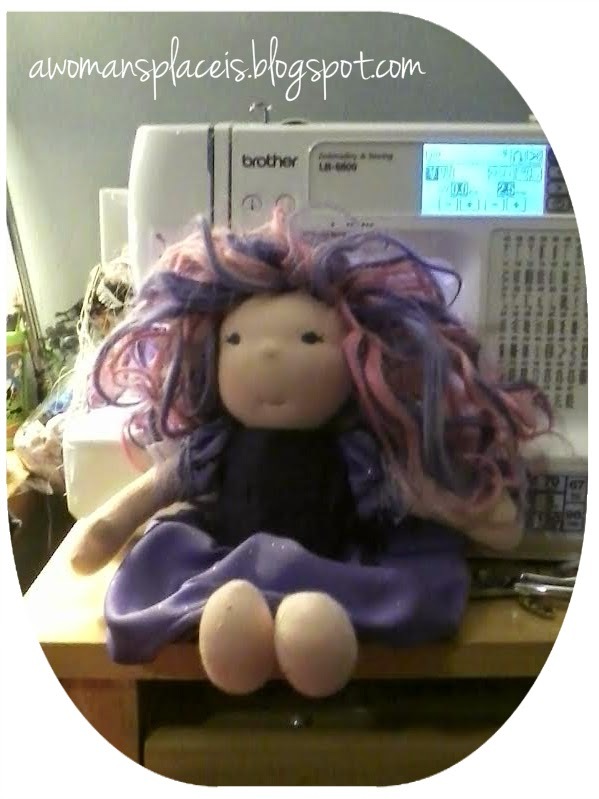 And Bibby definitely needed a purple dress to go with her purple hair! How pretty is that! Oh, what a delightful surprise she is going to have! It looks like something that would have come with the doll. You are such a good seamstress. It's really adorable. Looking at the Bibiana doll reminded me of another toy you wrote about recently, the one which soothed Maggie during the night. I recommended that to neighbors for their young girls, and it was a big hit. This year I noticed that there is a similar talking doll available which nicely recites the Our Father, Hail Mary, and Glory Be as you successively push the button hidden in the doll's paw (it's a lamb). I'm including it in the Easter basket for the neighbors this year, along with a "first rosary" for their girls. It seems like something your girls are ready for.